Home » F.A.Q.s » Does your company make a double magazine IWB holster? Q: Does your company make a double magazine IWB holster? Is it something that could be special ordered? Do you have any reason to not recommend such a holster? I’m wondering if you’ve experimented with the idea and found it’s too much weight hanging on the pants and belt by carrying a full size pistol and two magazines in two holsters? A: I can make a double IWB mag magazine holder. It would be about the same size as the holster for your pistol. I have two reasons that this is not a standard offering. 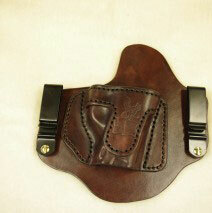 One is the weight and space it will take in the waist band about 18″ for both the holster and mag pouch. The second reason is that even with a single stack 1911 with 7 rounds with one spare mag you have 14 rounds to defend your self. As a civilian we should never put our selves in a situation were 3 to 5 rounds can not end the threat. Police and military put them selves in harms way and may find a protracted situation were more rounds are needed. Let’s be honest if some one is 21′ away and shooting back will you have time to change your mag twice? The extra mag isn’t worth the the all day discomfort. Your money is better spent on training ammunition to make the rounds you have hit their target. I have made double mag pouches for police and for competition shooters on occasion, all with specific uses in mind and none requiring all day wear. If you want a double mag pouch I will be happy to make one just contact me first to work out the details. Designer of the All Leather Invisi-Tuck IWB Holster.